US Federal Contractor Registration is encouraging all contractors in Texas or neighboring states to become a registered FEMA Contractor to help with disaster relief efforts. US Federal Contractor Registration is currently assisting businesses that would like to help with the disaster relief in Texas by submitting their FEMA Vendor Liaison paperwork and entering their information in the Disaster Response Registry (located in System for Award Management (SAM). Once a business is properly registered they are eligible to accept FEMA contracts to assist with the flood damage and debris removal in south Texas. Vendors can call the Contractor Helpline at 877-252-2700 Ext.1 to become registered begin winning available FEMA contracts. 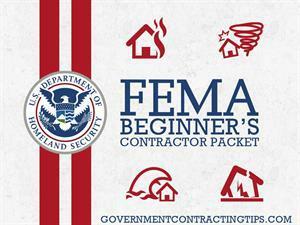 The US Federal Contractor Registration FEMA Contracts video on YouTube is also a helpful source when getting started as a government contractor. Contractors can find all the information they need to know about preparing as a government contractor for natural disaster relief. Businesses can also learn about obtaining advanced certifications such as the Corps of Engineers Contractor Registries, Joint Housing Solutions Group, Debris Removal Accreditation, and National Flood Insurance Program Adjuster. US Federal Contractor Registration encourages vendors to renew their government registration at least every 12 months in order to stay in compliance with the General Services Administration (GSA). US Federal Contractor Registration has assisted thousands of businesses with their government registration and FEMA registration to assist in the disaster relief efforts of Hurricane Sandy, Tropical Storm Dolly, the Winter Storm of 2014, 2013 Colorado Flood, Oklahoma Tornado, Tropical Storm Isaac and many more. US Federal Contraction Registration is the world's largest third party registration firm that has registered over 65,000 businesses in System for Award Management (SAM), and the previous contractor registration database of CCR/ORCA. Businesses can have a professional Acquisition Specialist from US Federal Contractor Registration help determine if their business is prepared for government contracting and qualified for the federal marketplace. 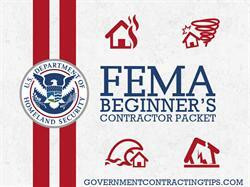 Businesses that wish to learn more about FEMA contracts can download the free FEMA Beginners Contractor Packet off of the GovernmentContractingTips.com website. Our FEMA packet is an informative collection of articles and information designed to help businesses get a head-start on the contracting competition. Vendors interested in learning how to bid on available contracts and becoming eligible for government contracts can call US Federal Contractor Registration Acquisition Specialist John Wayne at (877) 252-2700 Ext. 747 or visit http://www.FEMAContracts.com to learn more about FEMA registration.